Build Nepal – Summit Helicopters Pvt. Ltd.
MAF International, a Christian Organization that flies in the most isolated communities of the world to support the extremely suffering mass of people, collaborated with Fishtail Air during their Earthquake Relief Campaign in Nepal. MAF International appreciates every endeavor put by the Fishtail Air Staffs during the Campaign. 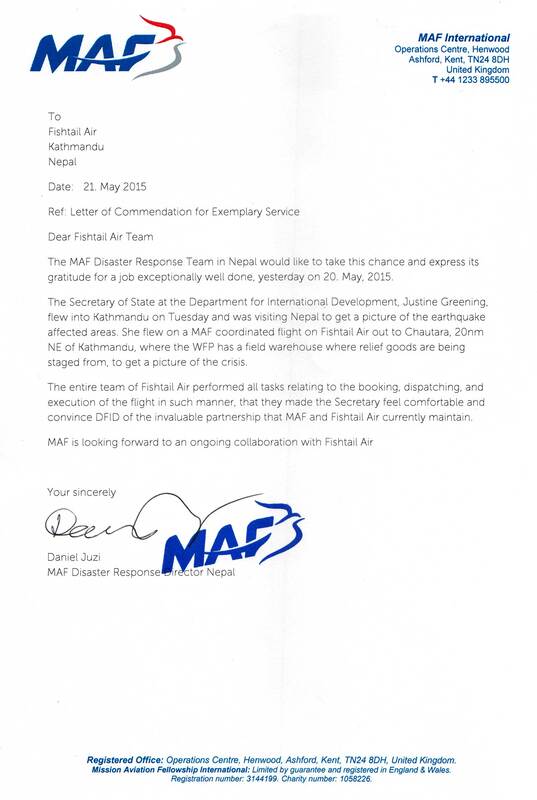 MAF Disaster Response Team in Nepal expressed its gratitude to Fishtail Air in conducting its work with excellence in all areas that include the booking, dispatching and executing of flights. MAF also has extended expressed its intention in continuing its collaboration with Fishtail Air for further Relief Campaigns in Nepal.